28 days worth of simple, healthy and nourishing meals and snacks. 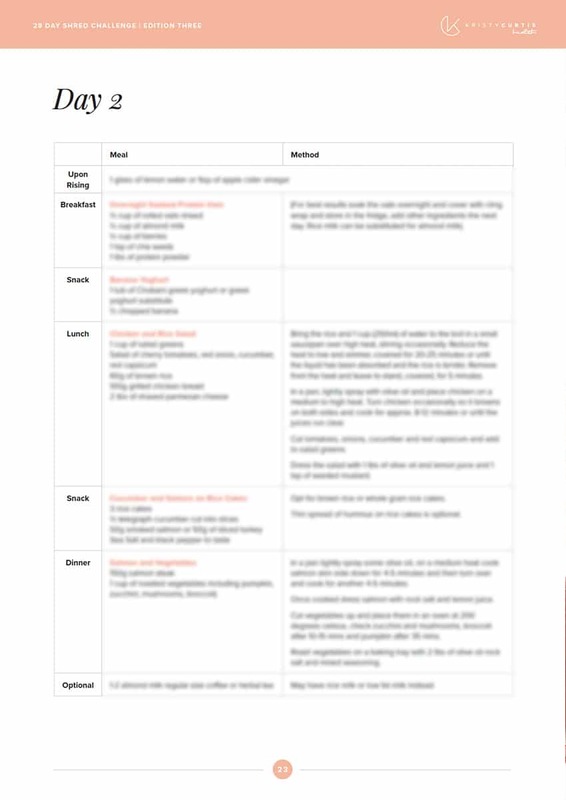 All recipes and food swaps included. 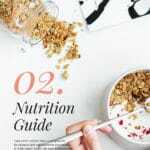 28 Day Shred Challenge (Edition 3) meal plan with calorie controlled micro and macro nutrient meals and snacks. Simple recipes included that are easy to follow and quick to prepare and cook. Tips to set you on the path of success and to keep you motivated throughout your 28 days. Accountability – share your success with other like-minded people in our supportive ’28 Day Shred Challenge’ Facebook group. Support and guidance from our 28 Day Shred Challenge staff for the duration of your program via our Facebook page. Access to Kristy Curtis Health promotions and give aways! 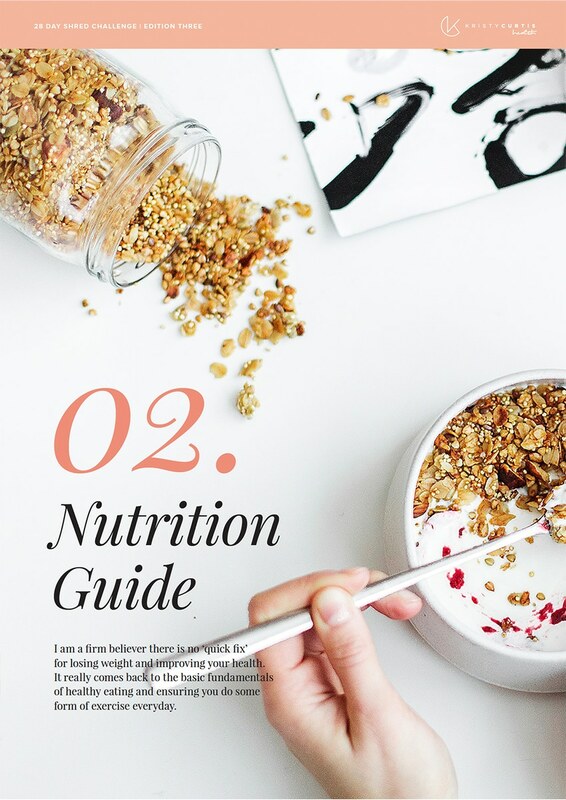 Newsletter with the latest Kristy Curtis Health tips and tricks. Results!! We know and understand what works the rest is up to YOU! 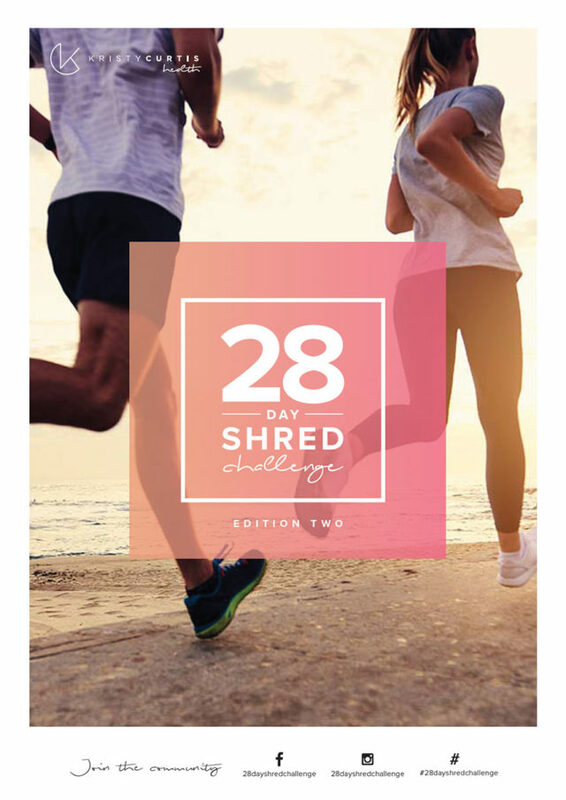 The 28 Day Shred Challenge program has been created by Kristy Curtis a personal trainer and health coach who has over 20 years experience in the health and wellness industry. It is designed to give you the flexibility to choose which foods you prefer to eat without calorie counting. There is no time like the present to get started so what are you waiting for? It’s time to take action and take responsibility for your health and only YOU can do it no-one else can do it for you. Banish the excuses, negative thinking and commit to this program 100% and you will be rewarded with more energy, fat loss and the confidence that this is the NEW YOU! Did I mention!! Plenty of support and no judgement! If you live locally to the Dee Why area we also offer specially designed Small Group training classes. They are designed to maximise your time with weight training, functional and HIIT style workouts so you can get to your goal faster. Get in touch for more information or to join a group today! My program works as it combines my unique “Active” exercises which, I know get results backed up with a nutritious and easy to follow menu plan! 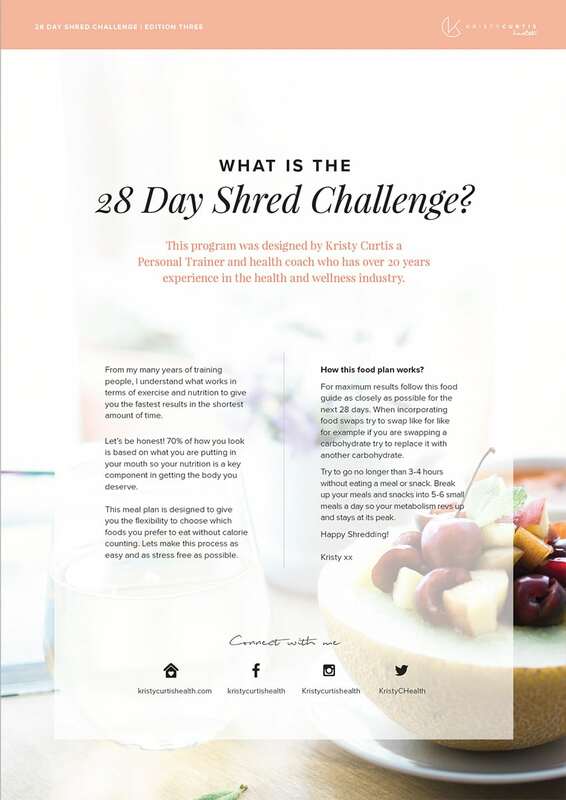 The ’28 Day Shred Challenge’ is written by Kristy Curtis Health Enterprises. Before you start we recommend consulting your GP for a check up before starting any new exercise regime. This program is not designed for people who have any food allergies. Individual results may vary. Not for resale. 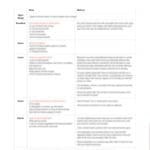 The information contained in this e-book is not to be copied or reproduced without written consent from the owner Kristy Curtis Health Enterprises Pty Ltd. All rights reserved. 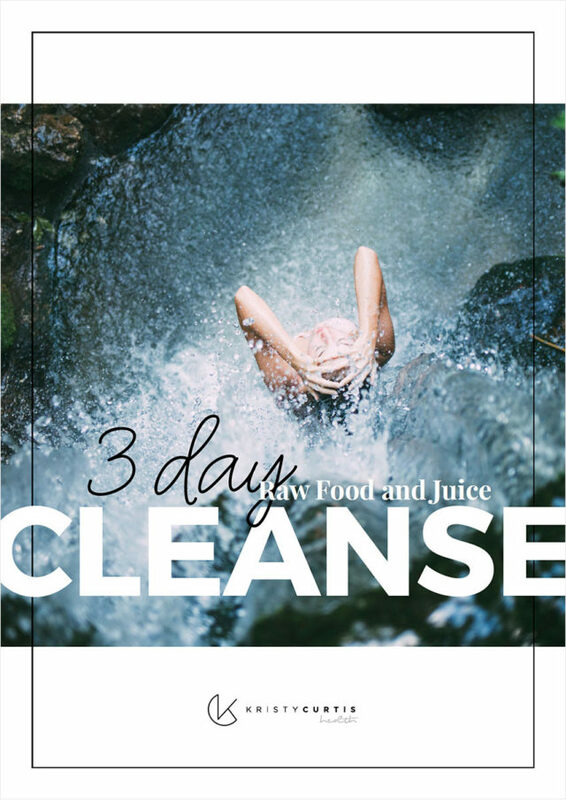 3 day raw food, vegan and dairy free eating plan. Reset, replenish and restore your energy levels!